4/12/94 – Pauline and Sean washed the shed floor and cleaned it out. 5/12/94 – Sean fell out of his bed and onto my mattress a couple of times during the night. The second time we switched. 8/12/94 – Pauline and Susanna went to the Nutgrove in the morning after dropping Sean at his playgroup, to look at trains for Christmas for Sean … [later] Pauline went to the Nutgrove alone. She bought Sean’s Christmas train set there. 9/12/94 – Santa Claus had been to the crèche this morning, and Sean had talked to him the most of all the children. 12/12/94 – Pauline and the kids went out and got a very large Christmas tree (a lodge pole pine like last year’s, eight feet high). They decorated it after we’d set it up. 24/12/94 – Pauline and I did the shopping in Quinnsworth while Sean was in the crèche. We also bought him some clothes … [later] All the presents were in place. 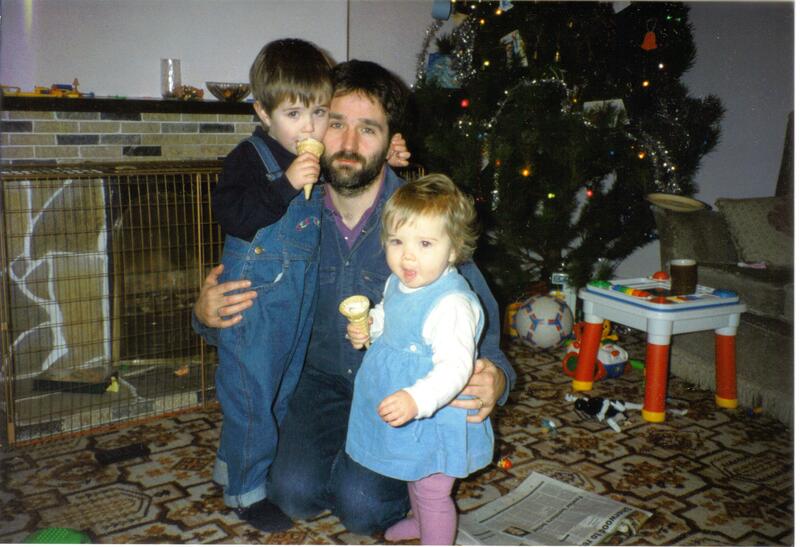 25/12/94 – Sean woke at 7.55, and Pauline and I got up with him. Santa had been, and had drunk the can of beer and eaten the biscuits. Sean was very pleased with the train set and the road track, which we assembled, and with his other presents … [later] Pauline and I had a bowl of soup each, and I made the lasagne for dinner. We went next door around 1.15, and met Karen, Aileen, Sean [F], Richard, Dolores, Andrew and Olivia and, briefly, Sean snr and Muriel. We had several drinks, chatted and ate smoked salmon and brown bread. Even our Sean ate the salmon, to our surprise. The kids all played … We left around four … and had dinner. Watched TV and played with Sean and Susanna until it was time to go next door again – around 9, I think. This time it was just us, Aileen, Sean [F], Karen and the kids. We had good crack, and I played Andrew’s guitar and sang, and we all had a sing song which was good fun. We left around midnight, and at Pauline’s request I sang another three songs in our house before we went to bed. 31/12/94 – Around 7 we went next door to see in the New Year with Sean [F], Aileen, Aileen’s parents, Andrew, Olivia and (some of the time) Karen. We had a lovely meal and, as usual, much beer. The four kids were up late. 1/1/95 – At 12 o’clock we sang ‘Auld Lang Syne’ and then went out on the street to greet some neighbours (it was freezing). Poor Cella was in floods of tears. We went back inside, and songs were sung till three or so with Sean [F], Aileen, Pauline and myself doing the singing. Muriel and Sean snr seemed to enjoy it well enough. Then home to bed. 2/1/95 – Pauline took Sean and Susanna to the Lambert Puppet Theatre in Monkstown to see Snow White and the Seven Dwarfs, which they all enjoyed. 7/1/95 – We all headed to Wicklow in the car. Took a long mountainy way to Newtownmountkennedy and went to the model park there (Susanna stayed asleep). Good fun directing remote-control boats on a pond. 8/1/95 – Took the Christmas tree outside, and Sean and I cut it up and bagged it. Pauline reorganized the livingroom. They all went to Dun Laoghaire for the afternoon. 11/1/95 – Sean was at his playgroup this morning; he, Susanna and Pauline went to St Enda’s Park in the afternoon. 12/1/95 – I shaved off my beard. It had been at its bushiest for probably 13 years or so, perhaps ever. It was surprisingly easy. I looked totally different, and Sean and Susanna were bemused – Susanna was frightened of me at first, but came round. 13/1/95 – Pauline, Sean and Susanna went swimming. 15/1/95 – We all went to Dun Laoghaire in the afternoon. We walked to the end of the pier and back (well, Sean was on my shoulders much of the time and Susanna was in her buggy). It was a fresh afternoon. Sean played on the cannon stand, then we went home via McDonald’s in Stillorgan. 20/1/95 – Sean was allowed to stay up until Granny and Grandad arrived (around 9.45 I think). Susanna was up too. Sean was up very late in the end. 22/1/95 – Sean is at Heidi’s birthday party. 24/1/95 – Sean was at his playgroup in the morning; Pauline, Sean and Susanna went to the Nutgrove in the afternoon. 28/1/95 – Sean is three and a half today … Pauline decided to take Sean to see The Lion King in Stillorgan; we drove over there and, after ages looking for a parking space, the cinema turned out to be full. 29/1/95 – Sean had a great time playing in the back garden with Elaine, Louise and Sean Ferris. 30/1/95 – Sean got a gun in the Nutgrove – he’d seen a boy with one like it in the park yesterday and had been dying to get one. It was a Winchester-type rifle that made a bang when fired. So, he’s delighted with it. 2/2/95 – Sean went to his playgroup as usual, then Pauline collected him and put him and Susanna in the college crèche in Dundrum while she went to her reflexology class. 3/2/95 – Pauline, Sean and Susanna went to the park in the morning. 13/2/95 – Pauline printed the photo of Sean and the guitar, which turned out quite well. 14/2/95 – Sean was next door again, having asked Aileen in the supermarket this morning if he could have dinner in her house. 17/2/95 – I got up with Susanna at 7.45 and Sean followed us down. At 9 we gave Pauline her card and sang ‘Happy Birthday’. 22/2/95 – Pauline and Sean painted under the stairs. 25/2/95 – Pauline and Susanna baked buns, which were eaten by us and various Kennedys. 28/2/95 – I put Sean to bed. These days I have to invent a lot of stories about mice or kittens called Sean and Susanna. A lot of memories, there, B.
Hello Boab … yes, a lot of good memories. Hope you and the family are well. Nice blogge. Give my love to Snakey.